Ever wanted to browse Wikipedia when on the go? Of course you have, and most 3G-enabled phone handsets will allow you to do this. But have you ever wanted a dedicated handheld machine that allows you to look at the three million plus articles in Wikipedia while offline? If you are one of the three people still interested, then read on! The WikiReader is a "palm-sized electronic encyclopedia containing the more than three million English language articles of Wikipedia that can be accessed immediately anytime, anywhere without requiring an Internet connection." This is according to its makers Openmoko. The device looks a bit like a Chumby. And a quick bit of research (thank you Google) reveals that its designer, Thomas Meyerhoffer, is also the designer of said Chumby. So, how does one get the entirety of Wikipedia on to the WikiReader? Simple, through the magic of microSD cards. And if you are scared that 3 million articles aren't enough and you want the most up to date information possible, then Openmoko is offering a quarterly update of everything Wikipedia related. The device is simplicity itself, offering the user just three options: Search, History and Random. With a touch-sensitive screen, you can type in a keyword for the article you want to see. Don't expect any frills with your information, though, as the WikiReader doesn't support images – it's just words, words, words. Also, it's not backlit either, but this does mean that you won't need to change the 2x AAA batteries for months. Speaking about the WikiReader, Openmoko CEO, Sean Moss-Pultz, said: "WikiReader is a whimsical look at the joy of learning in the digital age. It's personal and it's fun. We're extremely excited about sharing our device with the world." 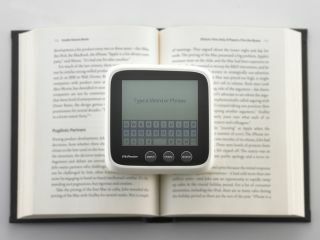 Available from today, you can get the WikiReader for the princely sum of $99. There's no word as of yet if the company will be shipping to Britain or any UK release date news. Go to www.thewikireader.com for more information.